Be Our “Bird-Dog” Real Estate Agent 2019! In today’s real estate industry, it is necessary for property developers and agents to think of a good marketing approach to effectively buy or sell a property. One good approach is by using the “Bird-Dog” scheme for real estate agents in 2019. Literally, the term ‘bird-dog’ is a reference to hunting dogs that point to the location of birds and retrieve any birds the hunter successfully shoots. In real estate industry, Bird dog is a real estate investing term that refers to someone who spends their time trying to locate properties with substantial investment potential. A “bird-dog” looks for motivated sellers or undervalued properties with the intention of passing the deal on to a real estate investor in exchange for a percentage, a sale commission or fee. Bird-dogs work as an intelligence network for real estate investors. Real estate investors may work with a network of bird dogs to increase the area over which they are looking for real estate deals. Similarly, a “bird-dog” will also develop a network of real estate investors so they have a better chance of converting a particular lead into a deal. The term “bird-dog” is more strongly associated with identifying properties for flipping, but it may also be used in the context of identifying income properties or residential rentals. Bird-Dogs are a modern type of real estate agent. 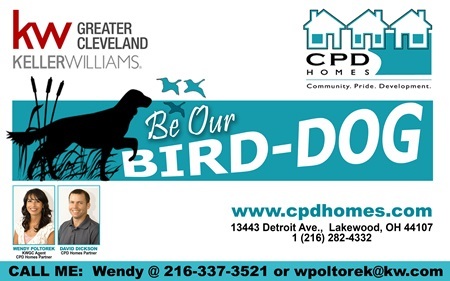 Just recently, CPD Homes also launched this program and called it “Be Our Bird-Dog!”. It aims to motivate real estate agents and partners to do the above-mentioned task, thereby earning commissions from it. So how does it work? Agents get the Listing with CPD when completed! That simple! And yet, there’s more! What’s in it for the Bird-Dogs? Enhance your profile as an ‘Agent’ in your community. In theory, acting as a bird dog is a valuable opportunity to practice identifying distressed properties that can be remodeled or simply touched up for a significant profit. In reality, there aren’t so many well capitalized real estate investors just waiting for the chance to train a bird dog. Successful bird dogs do exist, but they have likely spent years or decades in the real estate business and have a history of successful deals with a network of private investors. A new bird dog would find it challenging to match that history and experience. That said, if you are interested in becoming a bird dog, it may be wise to find a kindly real estate investor or a seasoned bird dog to learn from. The best thing to do is to contact us at CPD Homes through our landline at 216-282-4332, or email us at wendy@cpdhomes.com! We’ll be more than happy to train you as our motivated Bird-Dog! Call us now and let’s have a successfully shoots as you become our real estate agent for 2019!